Negative: what lens was I going to use? To put that in perspective, I'm a landscape and wildlife photographer. I want 20-24mm (equivalent) wide angles, I want a good macro lens with decent working distance, and I want a strong telephoto option. As I noted earlier, the 16mm f/2.8 is a weak lens (the Samsung 16mm and Olympus 12mm easily outperform the Sony lens). The Zeiss 24mm isn't wide enough for much of my work. The 30mm macro doesn't have enough working distance for the subjects I tend to photograph. And what's the long telephoto option here? 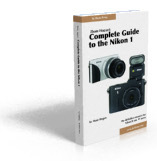 Basically, I had to do what most NEX enthusiasts have had to: power through the lens disappointment and come to grips with camera as it exists as a system, not as the marketing promise hyped us. With that as premise in mind, we're ready to proceed. At first glance, the NEX-7 body is a stunningly small and simple statement. For the APS sensor size it uses, the NEX-7 somehow manages to be smaller than a lot of other mirrorless cameras, even ones with smaller sensors. While there are a lot of plastic parts in the design, much of the initial bits you'll look at are metal and sturdy. Yet picking up the body only for the first time, there isn't a great deal of heft to it (10 ounces, or 291g). The impression you get is that of a high-end compact camera body build: small, relatively light, but sturdy and with only a bit of density to it. A tilting high resolution LCD. It doesn't have a huge range (90� up, 45� down), but this 3", 921k dot display will come in handy for low and high-level viewpoints when you can't put your eye at the EVF. A robust right hand front grip that's rubberized to boot. While not exactly recommended for shooting, you can one-hand this camera comfortably and you never feel like the camera is slipping away from you like you do with some mirrorless bodies. But it's the sensor that attracts most people's attention. APS means slightly more than a 1.5x crop from the old 35mm film cameras. 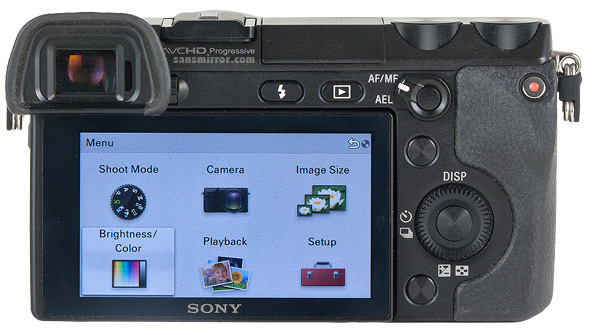 Most DSLRs sold these days have APS (DX) sensors. So here we have the same expected sensor performance as a high-end DSLR in a very small, mirrorless package. About the only things that will seem missing to the serious shooter are a wired remote and built-in GPS. I don't see those as big losses, and both can be worked around. The pieces are all there. It's the implementation that's problematic. The first problem is that it's unlikely that the NEX-7 is set from the factory the way you want it, thus you'll start menu diving to fix that. The second problem is that you won't figure out where the thing you want to change is located. The third problem will be that the nomenclature used for the thing, when you find it, doesn't exactly match what you're thinking it should be. The fourth problem is that when you look to the manual for help, you'll get further confused. I liked the word dpreview used: bewildering. (Actually, their wording was "almost bewilderingly", but I've simplified it here because that's what you'll probably experience: bewilderment). That's not to say that Sony's default choices are bad. Within a few minutes of stumbling around trying to figure out what unlabeled or vaguely labeled parts do, you'll figure it out. And that will be okay for a while, as Sony's choices, as I just noted, aren't bad. But at some point you're going to want to take more control over the camera, and that's where the frustration starts. Pick an exposure mode (Sony parlance: Shoot Mode) and stick to it. This locks in definitions for the dials, except for when you press the button next to the shutter release, which allows you to get to four other uses of those dials quickly (which you'll need to eventually define, see next). Program the Soft buttons to something you use a lot, and program the top-side function button the same way. Basically, between the soft buttons and the function button next to the shutter release, you want to make sure all the things you normally change are within a one-button reach. Be sure to cancel out options that you don't�use often so that you don't get into the multiple button press syndrome the NEX-7 sometimes generates. Personally, I don't want to set everything via these controls, just the three or four things that available through the normal controls that I use a lot. Do a full pass on the camera set at its defaults and note them all (as in write them all down and keep that handy). Beep is On and Auto Review is Off, which is probably the opposite of what serious users want. But note that Lens Comp: Distortion is turned Off by default, while Lens Comp: Shading and Lens Comp: Chro Aber (gotta love these abbreviations ;~) are On. In other words, the default camera is set in ways you probably don't want it to be. So take your default list and annotate it with the places where you want to override. Note that you have to do this for the Camera, Image Size, Brightness/Color, Playback, and�Setup menus. 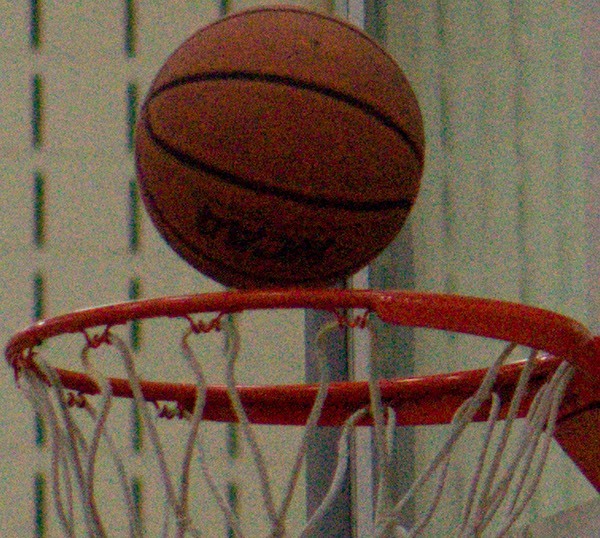 Then use that list before any�serious shooting session to make sure the camera is set how you want it. I can guarantee you that if you don't do this, some day something will get reset and you'll be doing a lot of shooting before you notice. While four bullet points seem pretty straightforward, what I just listed will take you quite some time to get set exactly as you want and documented for the future. Moving on. Let's assume you've got the camera set as you like. From there, handling suddenly gets very nice. Virtually everything you want to do can be done with the right hand. Of course, that means you can't be in a depth grip with your right hand, but it does mean that, once learned, your right hand position doesn't really have to change much to set most things you'd want to. Given that the lenses are relatively large for the E-mount, I'm usually cradling the lens with my left hand when shooting hand held, so I've got no real complaints about the way things work out once I've got my camera set to my desire. The EVF at the left side of the camera is nice, too: no more noses hitting the LCD and awkward side glance problems (at least for right-eyed shooters). The tilting LCD itself has a wide range of things it can display (and how it handles the aspect ratio can be tweaked, too). Some people will find the tilt angles a little restrictive, but for my shooting they work perfectly okay. Sure, we'd all like a flip out to the side option, but the camera handles ground level and above-head shooting just fine, in my opinion. Overall, the NEX-7 is a hassle to customize just the way you want it, but once that's done, it's a very nice, straightforward shooter. I personally don't judge the NEX-7 to be a continuous shooting camera (that focus performance gets in the way), so I can't say that I ever found the write speed wanting. I was a little surprised in brute force testing that the camera frees up buffer space relatively quickly when shooting at the usual 3.7 fps max. Even filling the buffer I was getting a bit more than a frame a second until I got to some unknown hurdle dozens of frames down the line (many cameras have governors that cut off continuous shooting past a certain limit so that the camera doesn't overheat). That said, the complete buffer takes at least 10 seconds to write to the card for JPEGs, double that for raw. Image quality: We've got a lot to deal with here, but let's start with the one that most people ask about most first: noise. Put another way, the NEX-7 isn't a high-ISO marvel. I didn't expect it to be. Some of you are looking for a camera "that does everything." There is no such beast, but the smaller the photosites and the smaller the sensor the less flexibility you have at ramping ISO upwards. The NEX-7 performs pretty much as I expected it to: solid low ISO work, decent and usable at ISO values I'd use in low light and indoor work, and falls apart if you push it towards the extreme ISOs. No surprises there. Curiously, there does seem to be manipulation of the sensor data at above ISO 3200. While some tests will show this as a smaller drop of dynamic range, I'll stick by my earlier statements of usability: stop at ISO 3200 on this camera. So resolution is left, and this is where we enter into some problematic discussion. 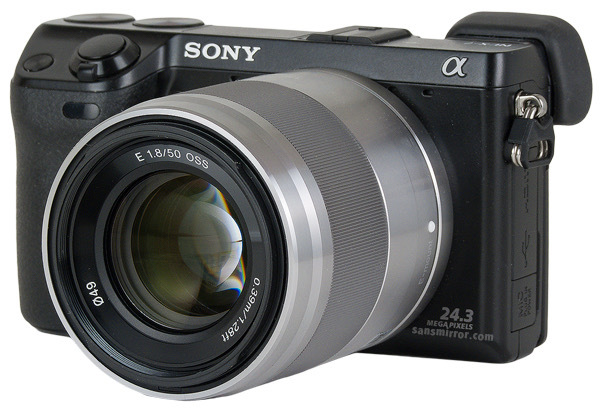 Let's start simply: a NEX-7 with its 24mp will resolve more than a NEX-5 with its 16mp. You have more sampling points, so you distinguish smaller differences. If you're printing the NEX-7 and NEX-5 at the same size and view the results at the same distance, what I just wrote applies just fine. The NEX series was already right above that margin with 16mp sensors. With 24mp, things are just even clearer: there aren't a lot of NEX lenses that perform well outside the central region. The 24mm, 30mm, 35mm, and 50mm are about it, and most of those need to be stopped down to really pull in the corners. So how does one in a review describe a high resolution camera? It's high resolution! That means that it better resolves whatever is in front of it, and that means that you'll see the performance of your lenses much more clearly. For a lot of people, that won't be a happy thing to see at pixel level. Now, it may seem like I've been a little harsh on image quality here. Not really. At lower ISO levels the NEX-7 is going to perform really well. So well that you'll see the quality of the lens you use. 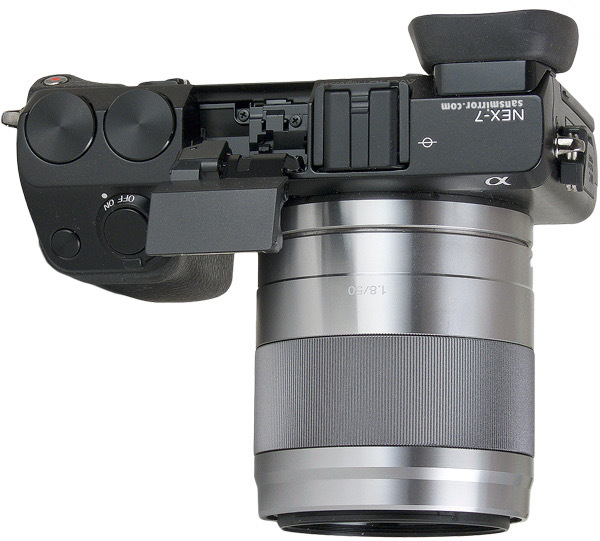 Sony didn't make any particularly obvious mistakes on the NEX-7 design. The feature set is complete. The UI is not only usable but highly adjustable to your preferences, at least once you decipher all the nomenclature and menu dive to set it up right. The performance of almost all aspects of the camera is at least good, if not very good or excellent. The spec sheets alone drew a lot of folk to take a close look at the NEX-7, and for the most part it doesn't disappoint in real life. There is a "modernness" to the design that some won't fancy; this isn't your father's DSLR, but a rethought out design for the 21st century. I'm not particularly bothered by that. I've been at the front edge of technology for over 30 years, including some technologies that haven't made it mainstream yet. I'm comfortable with the modernness. I just wish it had been a little easier to figure out. Well, lenses have something to do with it. The lenses I personally want aren't there or don't perform. I love the size of the 16mm f/2.8 on the NEX-7 body, but the 16mm isn't going to deliver what the 24mp can. The center will be good, the edges poor. Bummer. So what wide do I use in its place? Some might suggest the Zeiss 24mm. Now here's the opposite problem for me: the lens pretty much delivers what the 24mp sensor can deliver, but at 36mm equivalent focal length, it's not the right focal length for me. The sad thing is that the Samsung 16mm f/2.5 for their NX line is a better lens. I get far better corners out of it on my 20mp Samsung NX camera than I do with the Sony 16mm f/2.8 on my 24mp NEX-7. Indeed, one of the reasons this review is so late was that I decided that I wanted to sample the next generation of lenses for the E-mount before I wrote any final conclusions about the camera. I had the opportunity at Photokina 2012 to not only pretty much sample every Sony lens that's out or announced, but to take a look at a number of third-party options, as well, including the upcoming Zeiss lenses. I still haven't found the wide angle lens I really want, but at least I'm convinced that there will eventually be a wide choice of lenses that can deliver on the NEX-7, they're just not all here yet.